SAHBA members improve our community by supporting local charities and programs that encourage young people entering the field. Once a year members of the Southern Arizona Home Builders Association and friends take to the links for a good cause. Over the past few years alone, SAHBA has donated over $20,000 in proceeds from SAHBA’s Charity Golf Classic to important community organizations. This year’s event on Sept. 7th will benefit TMM Family Services. TMM has served the most vulnerable populations in Southern Arizona since 1974, including families at risk, children in foster care, veterans, seniors, and low income individuals that are homeless or are at risk of becoming so. TMM also manages 80 affordable housing apartments in Marana, TMM’s ReStore & Community Closet. 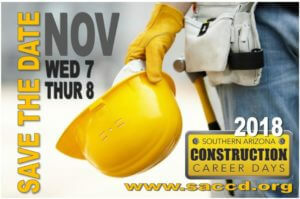 The Southern Arizona Home Builders Association is a major sponsor of this construction industry job fair. Working with other industry organizations including the Arizona Builders Alliance, Alliance for Construction Trades and Arizona Transportation Builders Association this annual event focuses on career opportunities in the construction industry for local high school students. The event offers students a close up view of the construction industry with hands-on demonstrations, operation of heavy equipment and interaction with industry professionals. SAHBA is a staunch advocate for workforce development including the Pima County Joint Technical Education District (JTED), a public high school district that provides free career and technical education to local high school students to help give them a head start on career skills. Members of SAHBA have supported JTED’s annual SkillsUSA competition whereby students compete in head-to-head competition utilizing real-world skills for activities like cabinet making and carpentry work. The Southern Arizona Home Builders Association has been a long term supporter of Habitat for Humanity Tucson. SAHBA volunteers have helped in the construction of several new homes for deserving families and SAHBA has donated over $10,000 from its annual fundraisers to this important this community non-profit organization. What better way to make a difference in a young persons’ life than mentoring. That’s why SAHBA has been an active supporter of Construction Coaching Opportunities to Reach Employment (C-CORE). The program, started by the Home Builders Institute, is a great way to help prepare young people for a professional career and to become positive contributors in our society.Through HBI Mentoring, industry professionals – like SAHBA members – provide youth with promise and untapped abilities with support and guidance about education and career goals. Additionally, youth are able to gain the skills and knowledge they need to build careers in construction and related fields. Email Art Flagg at Art@sahba.org or call 520-795-5114 ext. 233 for more information. Our professional staff is dedicated to providing a high level of service to our members and the community. We advocate for the SAHBA member’s interests in the community. We also provide information about home building and industry issues. Contact Us. SAHBA’s charitable and civic involvement supports organizations which provide housing and homeownership opportunities to those less fortunate in our community and workforce development programs.